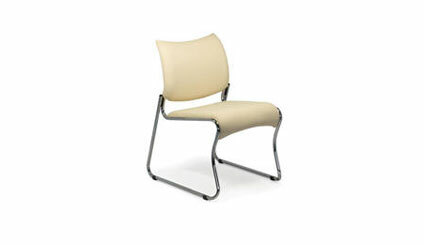 ART DESIGN INTERNATIONAL CAT STACKING CHAIR WITHOUT ARMS | ADI | Alliance Interiors Inc. This is one of the best side chairs on the market today. The solid steel structure and cantilever base allow the “Cat ” chair to hold users up to 250lbs with no problem. The inward curvature of the back and the waterfall edge seat make this one of the most comfortable side chairs that I have sat in. I recommend the Cat stacking chair in waiting rooms and rest areas, conference rooms, health care, training areas. Place them with cafeteria and bistro tables, restaurants and even for home office and dining rooms. This chair also sits well as guest and visitor seating. The seat and back fabric can be replaced easily in the field. The famous ADI suspension seat gives comfort to users that sit for a long period of time making the ADI Cat stacking chair a very good value for the money.